Mouvement Communiste analyse the background to the current Greek sovereign debt crisis. If we consider the social process of valorisation of capital in this country, we have to conclude that Greece was in a good state of health right up to the outbreak of the sovereign debt crisis. From 2001, when it adopted the single currency, the Greek economy has advanced with a growth rate of 3.5% GDP per year. The Euro zone which it is part of grew in the same period by 1.5%. The outbreak of the global crisis of credit affected it less than the Euro zone as a whole. ―For the first time, Greece resisted the global economic crisis better than many other countries in the OECD”, we can read in the OECD report about the country published in July 2009. In more detail: ―The robust expansion of Greece since its entry into the euro area has slowed significantly under the weight of the international crisis. However, the economy has weathered fairly well the initial impact of the shock that plunged most of the OECD countries into a serious recession. Growth remained positive until the end of 2008 thanks to relatively buoyant exports to the Balkans and large wage increases which supported consumption. The banking sector has benefited from marginal exposure to the toxic assets which were at the root of the international storm”. 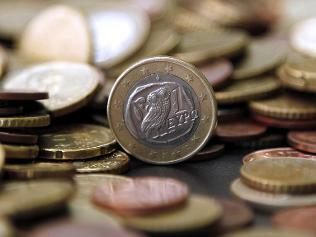 financial sphere) have increased their contribution to the growth of the Greek economy, particularly since 2005. This segment of the economic formation of the country has more than compensated for the virtual stagnation of industry and the continuous loss of agricultural land. But this tendency does not only apply to the Greek economy because it can be found, with various accents, to some extent everywhere in the most developed capitalist economic and social formations. Capitalism in Greece shows a concentration of the industrial and banking sectors, unlike the situation in agriculture or tourism. In 2008, the 20 biggest groups represented 60% of the total turnover of listed companies and 71% of their EBITDA (Earnings before Interest, Taxes, Depreciation, and Amortization - the gross operating margin, which is the closest thing to surplus value that we can find in capitalist accountancy). Telecom and 20% owned by the Greek state – is present in 5 neighbouring countries, controls the number one mobile phone company in Greece, Cosmotel and employs 30,000 people. With a revenue of €6.6 billion in 2009, it posted a fall in profits of 33% to €400 million, but since 2006 its EBITDA has been constant, slightly above one billion euros. In heavy industry, results have clearly been impacted by the consequences of the financial crisis. The steel-maker Sidenor suffered a net loss of €71.3 million after a profit of €29.3 millions in 2008. Its turnover plunged by 45.3% to €938 million. Its EBITDA is in the red by more than 20 million after having been halved in 2008. In 2006 and 2007, it was level at €160 millions. The pipe producer Corinth Pipeworks announced an increase of 128.5% of profits over one year to €20.2 million, despite a fall of 26% in turnover to 285.2 million. Its EBITDA grew 50% to €30 million, lower than the €48.5 million of 2007. With a turnover of €662 millions, down by 30%, Mythilineos maintained its EBITDA at €70 million, the same as the previous year, but 50% lower than the three previous years. Fourlis, a distribution company, notably an Ikea franchise, and also a distributor of consumer electronic goods, saw its profits decline by 42.6% to €31.6 million as sales fell by 4.2% to €751.7 million. Nevertheless it intends to open a dozen new Ikea shops between now and 2013. Its EBITDA, down by a third relative to 2008, is however around the average of results listed between 2006 et 2009. The maritime liquid gas transport company Stealthgas lost €13.3 million in 2009 against a profit of 30 million in 2008 following the cancellation of an order for ships which cost it €16.5 million. The company, which owns 37 LPG tankers still has 5 ships on order. While its EBITDA collapsed to €1.3 million, it had progressively climbed to €42 million over the previous four years. If some Greek banks have posted generally positive results, Geniki Bank (General Bank of Greece), mostly owned by Société Générale, and even more Emporiki Bank (Commercial Bank of Greece), the fourth largest bank in the country and a subsidiary of Crédit Agricole, have submitted record losses. This calamitous situation for the subsidiaries of French banks largely explains the intervention by France to support the Greek state and, indirectly, its own banks. In 2009, the losses of Geniki more than doubled to €110 million while those of Emporiki, while less than in 2008, approached €600 million, even more than the €400 million losses of ATE Bank. In contrast, the number one in this sector, the National Bank of Greece, realised a profit of more than €900 million – half of it in Turkey – even though it had fallen by 40% in one year. Other major banks, Piraeus and Alpha posted significant profits despite making important provisions. After the exceptional year of 2008 – €19.2 billion profits, more than 1000 new ships ordered for the yards –, the Greek maritime transport companies announced reduced results in 2009, but higher than expected. It is difficult to compare the profits of one year with another, the large amounts involved in buying and selling ships perturb the figures. The comparison of the EBITDA is therefore clearer. The study of the results from a dozen companies shows several rises in EBITDA, numerous falls, very few losses, with an average fall of 20 to 25%. While having their head offices in Greece, most of the ship-owners are offshore companies, listed mostly in the US. If the production of steel is no longer the indicator of capitalist development which it was at the start of the last century, it can still help to identify the cycles of developing countries. Greece is the only country in Europe, and one of the few in the world, to have produced less steel in the month of March than it did one year earlier. However, although its roduction in March, 165,000 tonnes, was 5.7% down on the preceding year, it was up 11.5% on that of February 2010, which may indicate, as some commentators claim, that the fall has stopped. For the whole of the first quarter, Greek steel production, 377,000 tonnes, fell by 30% compared to the first quarter of 2009. The production of Greek steel, which just exceeded 1 million tonnes (Mt) in 2000, rapidly increased in he following years to reach 2.5 Mt per annum from 2006 to 2008. In 2009, the Greek steel industry had suffered the consequences of the financial crisis less than the producers in other European countries, only recording a fall of 16% to 2 Mt. Dependent on building and civil engineering for its markets, the Greek steel industry saw its rate of utilisation fall towards 60%, one year after the steel-makers of the rest of Europe. If Greece possesses a few large commercial groups, the overall productive reality is very different. In effect, the economic infrastructure is constituted of small (and very small) and medium sized companies. For 2008, there were 820,000 SMEs (Small and Medium-sized Enterprises) employing 3,200,000 people out of a total (not counting unemployed) of 4,624,000 wage earners. *64.6% of workers (including the self-employed) are employed in workplaces of from one to nine people. *17.2% in workplaces of from 10 to 49 people. *5.2% in workplaces of from 50 to 499 people. *4.2% in workplaces of more than 500 people. If, on average, the growth of productivity – global productivity, all factors taken together – of the various sectors has been 1.29%, it has progressively slowed down. In the course of the 1970s it reached 2.71%, falling to 1.11% during the 1980s, then to 0.51% in the 1990s before practically stopping between 2000 and 2004 at 0.16%. It is agriculture where results have been the weakest, with a negative growth of 0.16% for the whole of the period. In construction the growth of productivity fell in the 1990s and 2000s, resulting in a fall of 0.34% for the whole of the period. The industrial sectors which benefited from the most important growth of productivity are the production of industrial equipment, mines, petroleum products, energy, chemicals and plastics. Across all services, productivity fell, particularly starting in the 1990s. This is particularly true for finance, public administration, commerce, health and, more recently, transport (despite a growth of 0.30% for the whole period).Foreign trade. The European Union accounts for most of Greece’s foreign trade, more than three quarters of imports and almost half of exports. In 2008, the exports went to Italy (11.5%), Germany (10.5%), Bulgaria (7.1%), Cyprus (6.2%), the UK (4.7%), Romania (4.4%). The main commodities exported are food products, manufactured goods, petroleum products, chemicals and textiles. For investments abroad Greece, which invests in its European neighbours, Turkey and the nearby Arab countries and no longer attracts capital, is markedly deficient. On 31 December 2009, the sum total of foreign investments in Greece reached $43.07 billion; those of Greek investments abroad $29.55 billion. The division into sectors is as follows. Agriculture, which employs 12.4% of the workforce only represented 3.4% of the GDP of the country in 2009. Industry employs 22.4% of the workforce with 20.8% of GDP. For the catch-all category of services, the figures are respectively 65.1% and 75.8%. Expressed in dollars, the GDP per capita of Greece, $32,100, is around two thirds that of the most advanced countries of the EU, putting it at the 42nd place globally. In the fourth quarter of 2009, the number of unemployed reached 514,401 with the rate of unemployment climbing to 10.3%. A year earlier, the rate had fallen to 8.1%, the lowest for a first quarter for ten years. The rate of unemployment for women, 14%, is practically double that of men, 7.7%. As in other countries in Europe, unemployment primarily affects young people, at 20.4% for those aged 15-29. For young women, the rate is 26.2%. The rate of unemployment is 11.7% for foreigners and 10.2% for Greek citizens. However, the rate of economically active foreigners is 73.6% against only 52.6% for people of Greek nationality. 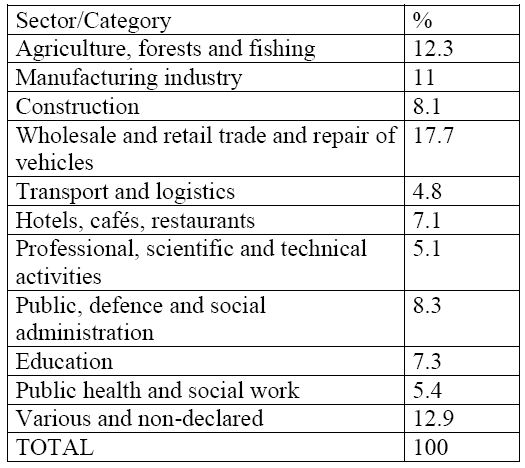 The percentage of people employed in the primary sector is 12.3%, in the secondary 20.8% and the tertiary 66.9%. Part-time workers make up only 6.2%. Among the economically active, wage earners are only 64.1%, a percentage markedly lower than in the other European countries. The self-employed make up 21.7%, employers 8.2% and the unpaid workers of family exploitation 5.9%. The outline of the important characteristics that we’ve set out shows that in the Greek zone capital is not doing too badly, at least as far as the big companies are concerned, and the impact of the crisis of 2008 didn’t hit it any harder than in the other countries of the euro zone. This is why it would be a mistake to attribute the present sovereign debt crisis to the industrial decline of the country.